Charging is an integral part of life. No matter where I go I’m forever scouting outlets and lugging around expansion packs to make sure I have enough juice to get through the day. My battery percentage is constantly on my mind, and at any given moment I’m acutely aware of how much is left and how long it’ll take to get back to a safe level. But for all my voltage vigilance, I don’t know a whole lot about what makes one power adapter better than another. PLX Devices knows charging. Its original Legion external battery redefined charging with its built-in OLED display that provides live feedback for a variety of useful stats. It quickly became my favorite way to charge, even when there was an outlet within reach. With Legion Meter, PLX is bringing that kind of battery know-how to the rest of our chargers. 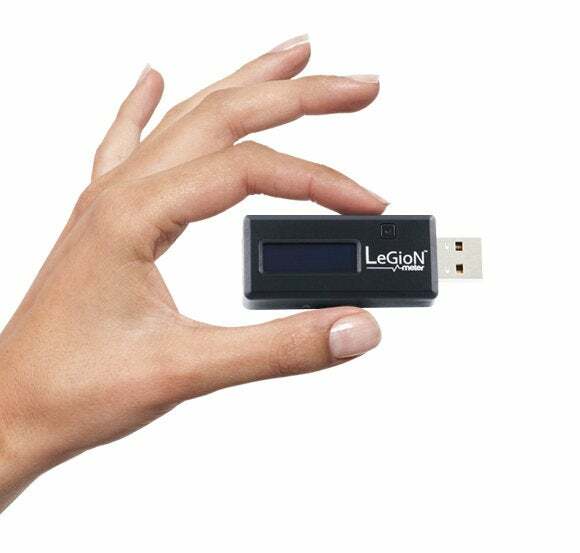 Small, light, and smart, the Legion Meter works with any USB charger in your arsenal, delivering accurate readings of both the port’s output and your battery’s milliwatt hours, and helping you pinpoint the fastest, safest ways to charge your devices. The miniature device doesn’t feel cheap, exactly, but the plastic assembly isn’t exactly up to the rugged standards set by Legion. A small button at the top acts as the wake and advance control, and you can long-press it to switch the orientation. At 2.5 inches in length, the Legion Meter won’t work so well in tight spaces, as it needs to attach to the end of your charger. After you insert the Legion Meter into your charger’s USB port, you’ll plug your cable into the USB port on the back of the meter. The Legion Meter instantly begins collecting data from each end, providing something of a diagnostic check of both the charger and the device being charged. It won’t actually alert you to anything that may be wrong, but a wealth of information is available on its tiny screen, including a reading of the USB port’s voltage, current, and power, as well as a running tally of the milliwatt-hour capacity of the device’s battery. But while Legion Meter is quite useful for testing the strength of your various chargers (as you might have guessed, Apple’s are among the best), the device’s premier feature is its promise to speed up your charging by as much as 92 percent. A recessed switch on the side toggles between accelerated charging (A) and data passthrough (D) modes. The switch is a pain to use, requiring a paper clip and a bit of force to move it, but it lets Legion Meter dynamically open and close the stream of data heading to your USB port, thus maximizing your charge speed. I didn’t see much of an improvement in the time it took to juice up my devices over a USB port with no data capabilities, but plugging into my Mac was a different story. Previously, I rarely used one of my MacBook’s spare USB ports to charge my iPhone, but thanks to Legion Meter’s ingenuity, I might be doing it a bit more often. When in data passthrough mode, your device will connect as normal, with your iPhone sipping whatever available power it can get, but all that changes when you flip the switch—all syncing with iTunes is severed, so every drop of USB voltage can be used solely for charging. While not quite up to the 92 percent claim, I consistently received faster charging through my Mac’s USB port, in some cases reaching about 50 percent higher speeds with my iPhone 5 (and about 25 percent with an iPhone 6). It’s not that PLX is overstating Legion Meter’s abilities, but in my testing, charging times varied widely depending on a variety of factors. For example, I found that when my phone was running low, Legion Meter was more helpful than when it was nearly charged, so there may very well be a combination of device and charger out there that delivers on the promised gains. But even with nominal increases in charging speed, Legion Meter will make a great addition to your charging arsenal. Legion Meter will provide everything you could possible want to know about your chargers, all while helping you maximize their potential.